What a charming hostel and pefectly located one block from the cathedral. I bought the Granada card which included 9 bus rides - useful for high and away places like the Alhambra and the Abadia de Sacremonte. Great staff and most considerate personnel. Great location, very helpful staff. The building is a bit drafty and cold in the winter but the room had a heater that worked fairly well. Great place to stay. 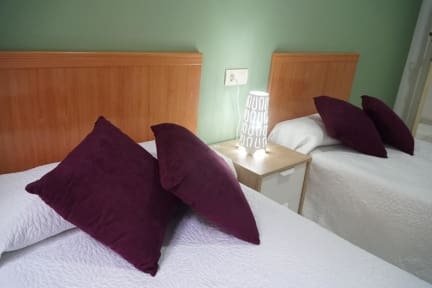 1 min walk from the Cathedral or from the Nuevo Plaza, clean and nice pension (private room even has a TV), towels and toiletries included, stuff is extremely nice and accommodating; great value for money in Granada. Nice place with good balcony views right in the middle of the city. This place is more like a hotel with a shared bathroom. Never even seen any other occupants. Employees were very helpful and knowledgable. They even let us shower after we checked out which was really cool of them to do. I would stay here again. Hostal Antares had everything I needed. It was an affordable single room with bathroom in a central location. The staff at reception was friendly and gave me points of interest on the map. There's no common area or social activities, but a nice place to relax. The staffs are very nice, special thanks to Eduardo. He’s very helpful and explained the cities very well. I went to some places he’s recommended and it’s absolutely lit. The hostel itself located at the very busy alleys so it’s a little bit noisy as lots of bar downstairs. 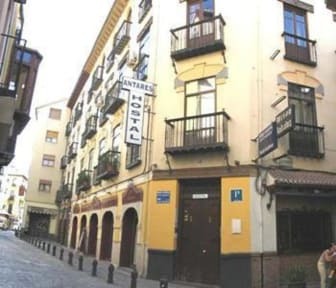 The hostel's location is perfect, close to all points of interest in Granada. The rooms and facilities are minimal, but given the cheap price we paid, we couldn't ask for more. If you're a solo-traveler hoping to socialize, know that there's no kitchen or common area. And the cleaning staff used an aroma spray in the hallway that was absolutely horrible and unnecessary. Other than that, all cool. Amazing location right in the centre, staff cleaned the room every day. No atmosphere as it’s more of a hotel, so didn’t really see the staff. Booked for a double room but got a twin room, wasn’t an issue so didn’t bother saying anything. Great location and spacious room. Helpful staff and gave us a hairdryer which was not provided in the room. Only thing we would suggest is a small lamp in the room would have been good as well as heating as the room was quite cold and the top light was too bright for the evening.